I spotted these hatched eggs while strolling through a local park. I like how they have a sort of dashed “break here to exit” line at one end. I also like how you can see the cell structure making up the eggs, a bunch of little hexagons. I only wished I’d found them before they hatched. I’m not really happy with this photo. I really need some way to easily diffuse my flash in the field. Not only are there flash hotspots, but you can actually see a recognizable reflection of the camera on each shell. Nonetheless, I thought the eggs themselves were worthy of a post. 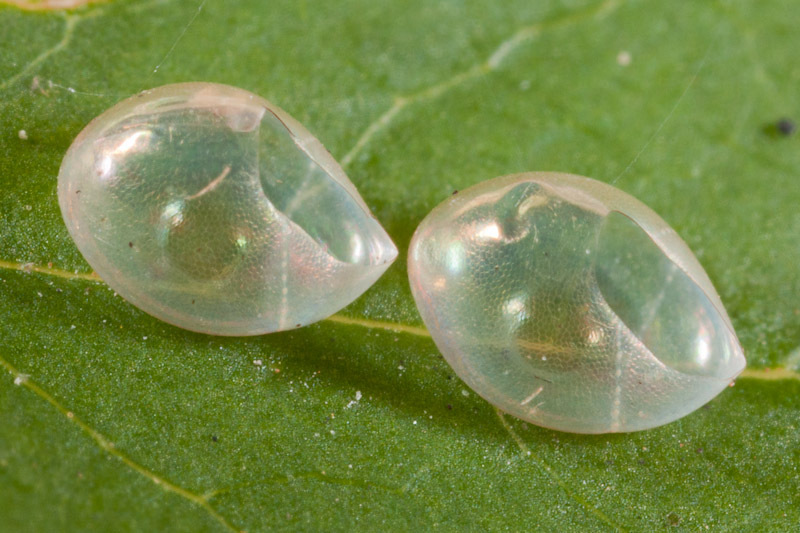 I just wanted to mention that I’d probably have never known what coreid eggs were, or many of the other things in my book for that matter, without BugGuide.Net. Thank you for creating that fantastic resource! Great blog so far, I look forward to visiting periodically. Yes, with shiny, round objects like that, it is very difficult, if not impossible, to avoid getting bright highlights and/or an image of the camera and photographer. I have tried shooting partly through a white plastic diffuser (plastic bowl), but I still get hotspots. The guy who does the blog “No Cropping Zone” has some useful tricks on macro flash–you have likely seen it.